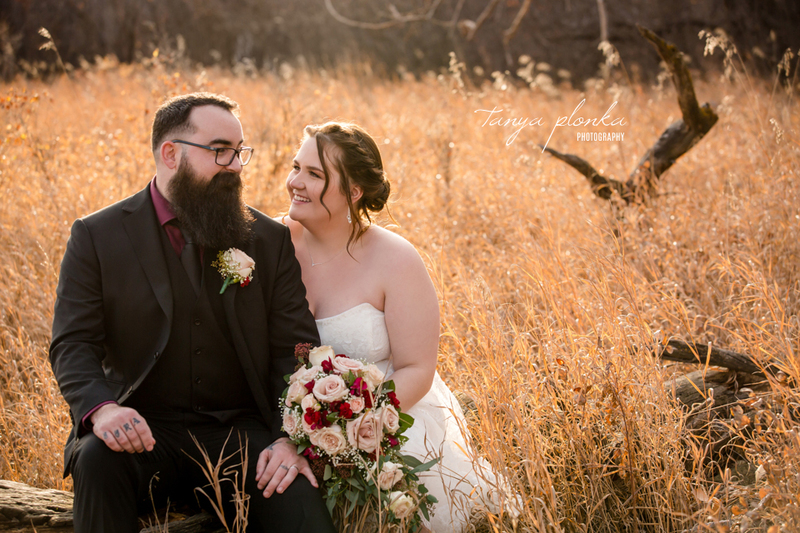 Stacie and Gerrit planned a romantic Lethbridge Sandman Signature Hotel autumn wedding with dark grays with deep red accents, all of which looked striking with the fall colours. In mid-October, we’re never quite sure what weather we’re going to get. Stacie and Gerrit were treated to all of the weather! The temperatures climbed early in the day, along with quite a windstorm that drove us indoors for family portraits. We refused to hide from the weather all day and sought shelter in the Helen Schuler Nature Reserve. While Stacie and Gerrit laughed and had a great time with their wedding party in the river bottom (along with a lot of getting lost in each other’s eyes), the sky became blacker and blacker until we started hearing thunder and seeing lightning! We finished their photos in a downpour before rushing back to the safety of the hotel. Their reception was filled with so many sweet stories from their families. Wedding receptions usually turn into a bit of a roast, but theirs was mostly a celebration of how loved they are by everyone around them (with a healthy dose of roasting from their siblings). 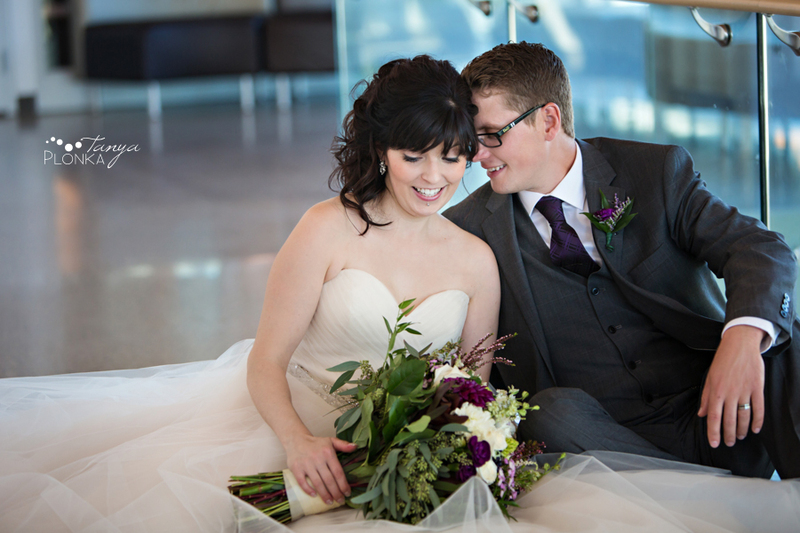 Kendi and Roy had an intimate Lethbridge Sandman Signature Hotel late autumn wedding. Their immediate families and best friends got to take part in their ceremony in the hotel’s courtyard. It was such a quiet day at the hotel that it felt like they had the place all to themselves! They were all smiles and quietly joked with each other through facial expressions during the ceremony. They made Roy’s daughter Cora an important part of their day, having her stand with them as the only member of the wedding party and then bringing her along for portraits. She even had awesome shoes to match Kendi’s! After the family was sent off to get an early start on the reception, we headed to the Helen Schuler Nature Reserve on this beautiful day for their portraits. Now that the colours outside have subdued for the season, their red wedding accents really popped! Kendi and Roy were so easy to photograph when they spent the whole time snuggling and giggling together. 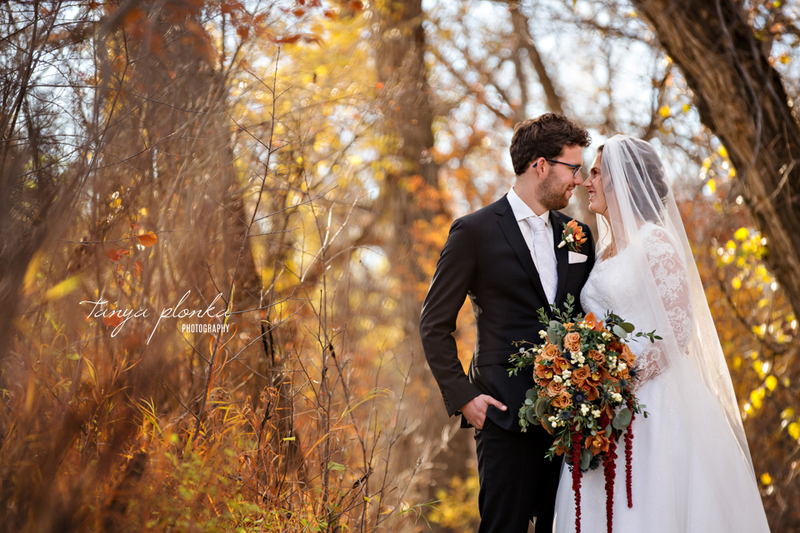 I know it’s early in the year, but I think Kim and Nathaniel may be one of my most passionate couples this wedding season. The way they looked at each other and snuck kisses even when the camera was down was so romantic! We started out the day greeting them as they arrived at the NRC church in Lethbridge and followed Kim as she walked down the aisle to her soon to be husband. For photo locations we focused on Lethbridge Research Centre wedding portraits, which was stunningly green this time of year, followed by a quick visit to Henderson Lake and the old red firehall downtown. Kim and Nathaniel were surrounded by so much happiness and laughter throughout the day. From Nathaniel’s friends’ dry humor to Kim’s sisters’ theatrics, we rarely stopped laughing! p.s. Thank you to Melanie from Photo Expressions for being my second shooter for the day! 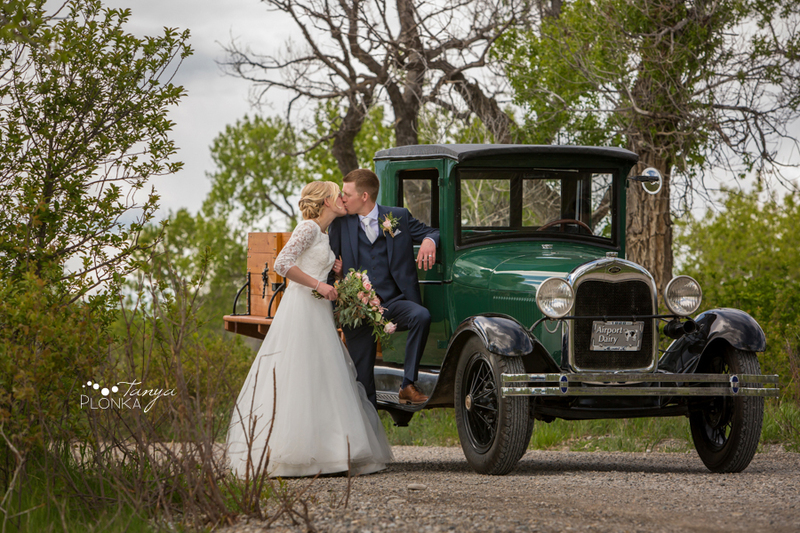 We met up with Janelle and Gerald for their Fort Macleod spring wedding photos just after their ceremony and luncheon in the town. We managed to squeeze in all the family photos just before it suddenly started raining! Janelle had totally planned ahead and picked out a fantastic hangar for indoor photos so we could stay dry. Once the rain finally lifted, we headed back outside to get photos with the amazing vintage car they had for the wedding day. It took a little longer to drive from one point to another and Gerald had to carefully drive around bumps in the road, but it was *definitely* worth it to have such a sweet ride. Janelle and Gerald kept their wedding intimate by not officially having a wedding party, but brought some of their closest friends along for photos. This gave us a little more time than normal to focus on the couple and how sweet they are together. I loved how classy they looked with how perfectly tailored the dress and suit were, especially next to the vintage car. Everything about the day was so romantic. When Denise and Koos planned their wedding, I think they were expecting a little more spring than the winter wonderland they received! 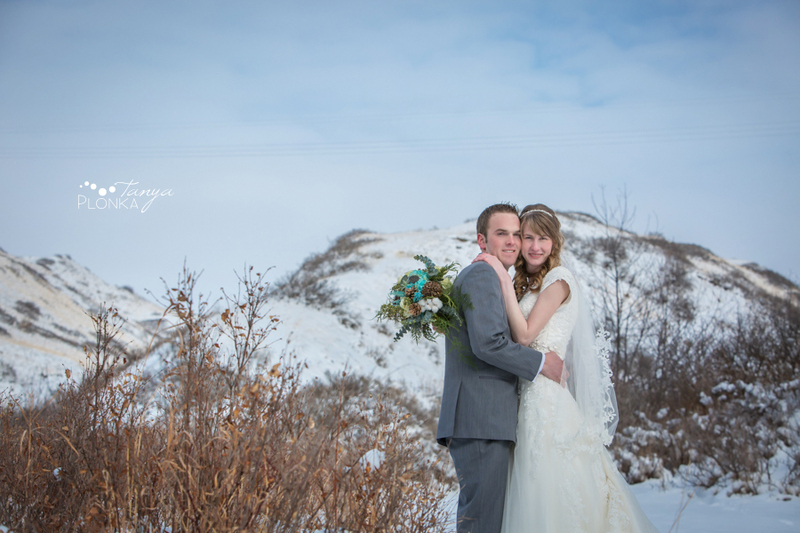 The tiffany blue and gray color theme they chose looked gorgeous for their Lethbridge snowy late winter wedding, offering a great compliment to the cool hues and bit of blue popping out of the sky. After their ceremony at the Lethbridge Netherlands Reformed Congregation, we met with them and their family and luckily could keep everyone inside and warm for their portraits. Next we were off to the Broxburn Cafe who generously let us take a few photos inside to warm up. Everything about that location looked fantastic with the wedding colors and their rustic touches. The wedding party was so awesome about sticking it out in the cold and smiling despite the temperatures! Denise and Koos were so lost in each other throughout the day that they hardly noticed the cold. Their embraces kept them warm and showed off how sweet and caring their relationship is. At the end of the night we returned to their reception at the Lethbridge Lodge where they had both hilarious comedy sketches and moving presentations from the family. Thanks to Melanie at Photo Expressions for assisting that day. Their ceremony was held at The Gate in downtown Lethbridge, which was conveniently close to both their portrait and reception locations. They loved the modern, bright feel of Casa so we did most of the portraits inside the art building. All of the colors there worked perfect with the gray suits and purple accents in their wedding attire.